Question: I fish a lot of small streams and beaver ponds where no wading is required. My problem is that my line gets tangled around the grass, bushes, and whatnot at my feet. Before every cast, I have to untangle the mess on the ground. What’s the best way to avoid this? 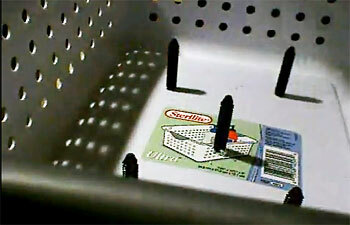 A homemade stripping basket can be constructed of auto push-rivets and other materials that cost less than $10. Answer: There are really only two options—keep the line in your hands or wear a stripping basket. Although the hand-twist (or figure-8) retrieve seems to have gone out of style, except among chironomid anglers, it’s a solid way to keep your line off the ground. Basically, you are using you hand as a spool around which you are winding the slack that you retrieve. It’s actually quite simple once you’ve mastered the rocking hand motion required. Here’s a good series of illustrations showing how the great Leon Chandler did it. The only problems with the hand-twist retrieve are that it doesn’t work when you need a fast retrieve, and when you do get a strike, you have to avoid dropping all the slack at once, whereupon it could tangle and cause you to break off the fish. An even simpler, though less conventional solution, is to wear a small stripping basket. Wading saltwater anglers have long used these contraptions to keep their lines from sinking or getting tangled in floating weeds. There are lots of great stripping baskets on the market, even smaller ones you could use for trout fishing. But you certainly don’t need anything fancy for your fishing: any dollar-store mini laundry basket, held onto your waist with a cheap bungee cord will do the trick. Then you just have to adjust your stripping motion to pile the line in the basket, whether you wear it in front of you or on your hip. Other trout anglers may look askance at your basket—and you might hear a few disparaging remarks—but you’ll keep your fly in the water much more.